Near the Ashram, there is a small hut where we can stay. A small water stream provides us with pure water. The way beyond Ashram leads to a rivulet, crossing which we can reach the cave of �LUV-KUSH�. To reach this spot we have to ascend the way of waterfall for one and half hour. Above this cave there is a precipice called 'Cradle of Sitamai'. In the cave there are the carved �Padukas� or the footprints of Luv and Kush. This precipice is a real challenge for trekkers. The ashram is a sacred place and people from all over Maharashtra come here. There are some carved stones near the ashram, on which some carved idols depict some story. From this place, we can visit Ratangad. 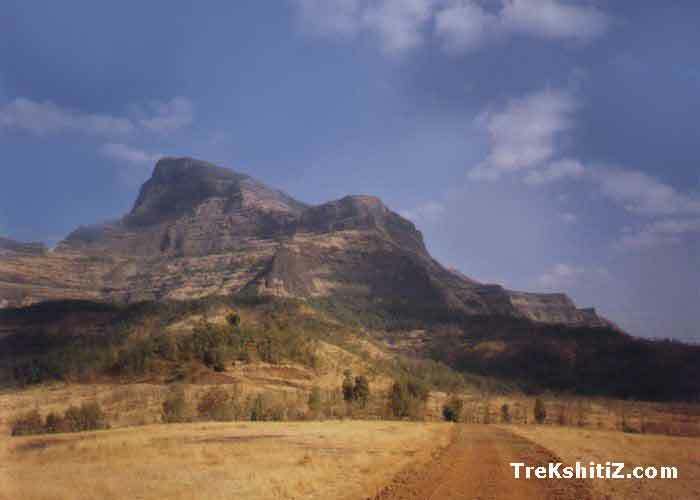 For a 5-day cross-country trek, the trio of Ratangad - Harishchandragad-Ajoba can be planned. To reach the top of the fort one should follow the route of Kasara-Ghoti-Rajur-Kumshet. a) One way is treaded by bullock carts and goes to the plateau where the ashram is situated. c) Third way goes through the forest. Near to the ashram, there is a hut where about 20 people can stay. Care should be taken from snakes and scorpions. Generally people prefer this place as one-day trek, especially in rainy season. A beautiful waterfall is formed in monsoon. One should make arrangement for food. The water stream provides us drinking water.